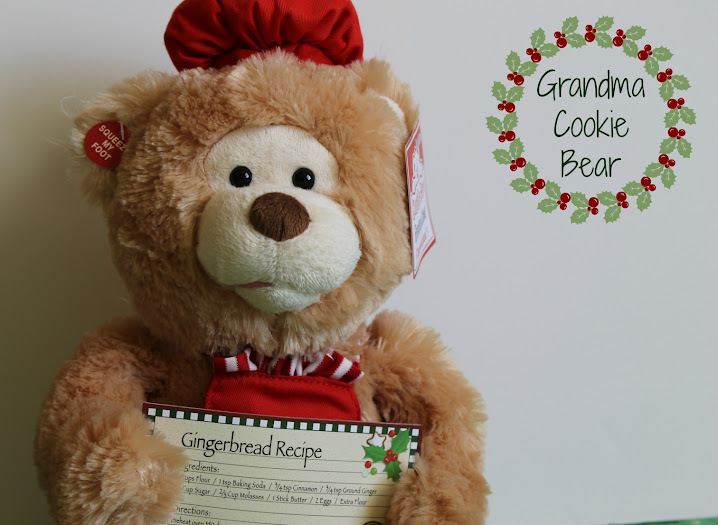 Thank you to Cuddle Barn for providing a Grandma Cookie Bear to add some Christmas cheer to our table. All words and opinions are 100% my own. Decorating for Christmas has been kind of a big deal my whole life. For as long as I can remember, my parents went out of their way to make the season special for us. The excitement would start when my father headed upstairs to drag the huge boxes of Christmas decorations and ornaments down from the attic. We’d then usually bundle up and head out to the woods on our property to cut our trees, including a mini one for each of the kids’ bedrooms. 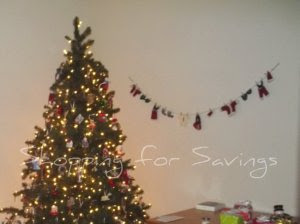 I’m thankful that I married someone that not only indulges me but also enjoys decorating for the season, as well. 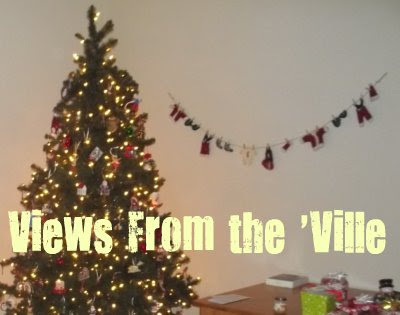 We usually put the tree and other decorations up the week of Thanksgiving. Putting things up just a bit early allows Ashley to participate. After the short Thanksgiving break they have, she doesn’t usually get home again until the semester ends just before Christmas. 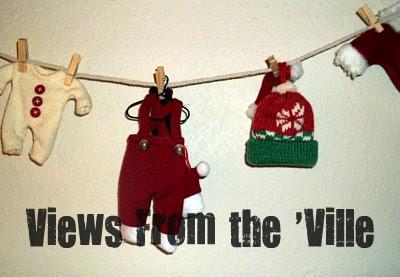 Make at Home Monday is late this week, but I wanted to share with you a quick and easy decorative Christmas craft that you can make: Christmas Clothesline Swag. I first saw this sold by AVON like a decade ago and I thought it was so cute. After buying one for my Mom, I thought it would be really easy to duplicate so I made a few of my own. Once you make one, you’ll probably make five; they’re quick and easy to customize to fit whatever decorating theme you follow. You could do felt top hats and carrots, plus buttons, and have a snowman clothesline; knit socks and hats, thermal long-johns, and scarves for a general winter theme; or felt and wrapped candies for a Visions of Sugarplums theme. Use your imagination; the ability to personalize is one of the best parts of this project. Cut a length of cording about 6″ longer than you want your finished swag to be. 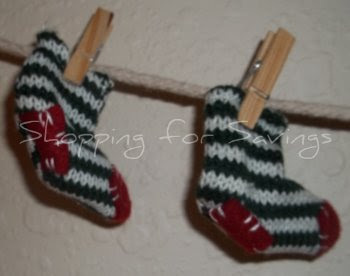 Tie off a small loop at both ends (for hanging). Starting a few inches from one end, move along the length of the cord and attach the mini clothespins at evenly-spaced intervals. Use 1-2 clothespins to attach an article of clothing or other item, as shown below. There are a number of different places you can find items to clip. I found a cute pair of mittens at Hallmark this season; they were a package tie-on, and cost less than $1. 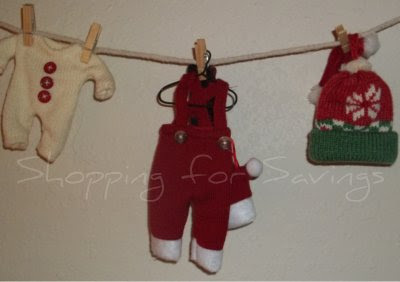 You can also check the newborn section of clothing stores for socks and maybe even hats and mittens; make a few items from felt; or raid your kiddos’ dolls for some of their accessories. 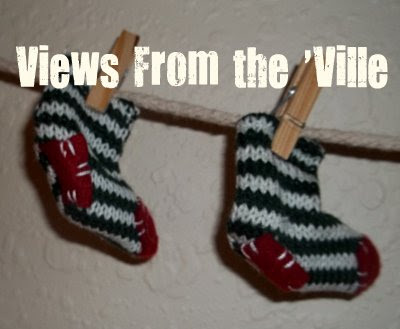 What theme would you choose if you were going to make a Christmas Clothesline swag?